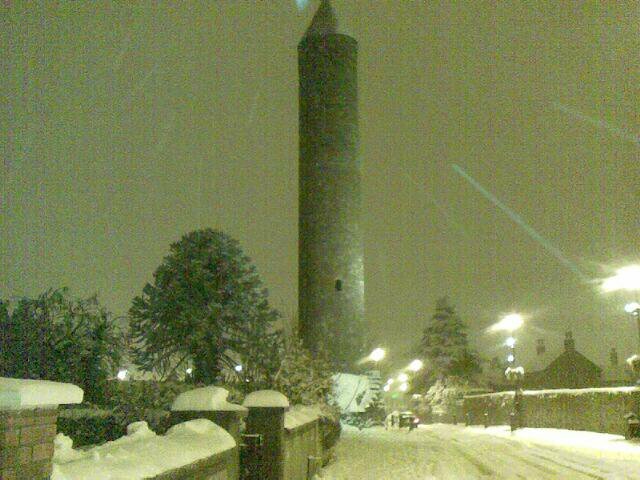 • Clondalkin Round Tower is approximately 1,250 years old; it is a national monument and forms the historic heart of Cluain Dolcáin. • Round Towers are a uniquely indigenous form of Irish architecture and the Clondalkin tower is acknowledged as the most perfectly intact example of these ancient structures. It is also one of the oldest intact man-made structures of any type in Ireland. • The tower is built of local calp limestone which shows no sign of being worked or shaped by a mason. It is the most slender of all round towers in Ireland, being 27.5 mts (90ft 6ins) in height with a circumference of 12.7 mts (41ft 8ins). • The buttress of small stones and rubble is unique, not appearing on any other tower. It was not part of the original structure and was built using different materials. • In common with other round towers, the door is elevated above ground level (3.9mts) and the door, which faces east, is square-headed with four jambstones on either side. These stones, along with the sill and lintel, are of granite. • There are six windows in the tower, one on the first floor facing south, one on the second floor facing west, and four just below the cornice facing the four cardinal points. • The cap which sits on the cornice is reputed to be the original. • The Round Tower is the subject of numerous drawings and paintings by famous antiquarians over the ages, including Samuel Molyneaux (1725) and Berenger and Wakeman (1843). • The Tower is associated with 7th Century Saint, Crónán, the founder of the monastic site on which the Round Tower stands and is thought to have been built to house his relics. • Modern Clondalkin is a vast suburban area yet the circular one-way system in the busy village follows the outline of the original monastic settlement of which the tower is a part. • The tower is a source of considerable local pride and is a potent symbol of local identity, featuring in the logos of many Clondalkin organizations.